1.2 Flu and cold differences? -Type A: It is the most common cause of infection. It is the most serious type of flu. – Type B: It is situated in a particular geographical area. It doesn’t offers such a seriousness effect as the previous one. – Type C: This is the least severe, with symptoms similar to colds. It is the disease that causes the greatest proportion of sick leave either at work or at school.. It typically produces large saturations of patients in hospitals during an outbreak. Flu has more acute symptoms than cold. Besides the fact that common cold may occur throughout the year, while flu tends to occur during the winter, flu is different from cold primarily because the affected individual has far more sudden high fevers that go up easily to 39, 5 º C but can reach 41 º C.
Moreover, flu distinguishes from cold because it produces a feeling of heaviness and pain throughout the body, particularly in the joints. Headache is usually stronger in flu than in the cold. Patients typically have dry cough. 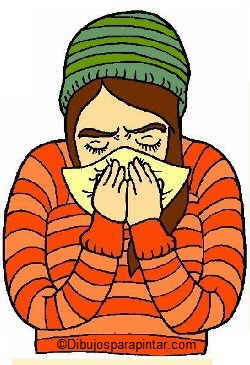 Whereas a person may have multiple colds each year, however, the flu, if any, appears only once every year. We must distinguish this disease from that one called “stomach flu” that occurs when bacteria infect the digestive tract. The main cause of this disease is a virus inhalation. Flu viruses spread like common cold viruses through the microdrops floating on air caused by another patient’s breathe or cough. It can also be spread by touching a contaminated object and putting the fingers in contact with the mouth, nose or eyes. The natural treatment of influenza involves using a series of natural resources that can help prevent the spread of the disease or lessen their symptoms or their duration. We can say, to some extent, which is a kind of “natural vaccine” to the disease. More information about flue and its natural treatment.